(in hematology) a preponderance of polymorphonuclear neutrophils having three or more lobes, indicating maturity of the cell. The phenomenon is common in severe liver disease and advanced pernicious anemia. It indicates a relative lack of blood-forming activity. 1. In a differential count of white blood cells in the peripheral blood, the absence of young and immature forms. 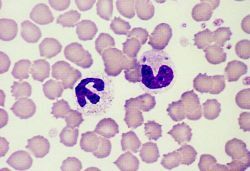 In a differential count of leukocytes in peripheral blood, absence of young and immature forms. Pinera s victory over ex-President Eduardo Frei of the ruling leftist coalition marks a shift to the right in South America, a region dominated by leftist rulers from Venezuela to Brazil. national security policy and the decades-long shift to the right in American politics. This reflects a general shift to the right in American politics, under the impact of a sick economy whose symptoms were blamed--rightly or wrongly--on liberal economics. But Ms Cooper will insist the repositioning does not represent a shift to the right as she argues there must be an effort to distinguish between "immigration that works and immigration that doesn't". The shift to the right and the rise of militarism in Japanese society have reached to a serious stage," the Rodong Sinmun, the newspaper of the ruling Workers' Party of Korea, said in an analysis piece, in the first reference to the Dec. In a shift to the right, the Tory leader will warn that schools, hospitals and other services are being overrun by foreigners. He insisted that he would continue to occupy the centre ground and rejected suggestions that a new harder line on law and order represented a shift to the right. But the remarks were seized on as evidence that the party had undergone `` a shift to the right of terrifying proportions''. The change in his attitude has reflected a shift to the right in Japanese society. The shift to the Right is likely to continue on issues such as housing policy, where Labour will belatedly start to champion home ownership; on nationalisation, where accountability rather than public ownership will become the goal and even on incomes policy, hitherto anathema to the Left. Kinnock sets out to rebuild party; RETRO REPORT OCTOBER 1983 - How we covered.. The combination will raise fears that Mr Cameron is about to embark on a major shift to the right. In a shift to the right, he brought John Redwood back into the Cabinet, along with Nicholas Soames and David Cameron.